Burton Bradstock is situated along the coast road between Bridport and Abbottsbury. The nearest town is Bridport which is 2 miles away. On entering Burton Bradstock from Bridport, turn left after the Anchor Public House into Shadrack. 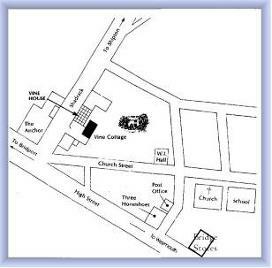 Vine Cottage is on your right facing the side of the pub set well back from the road.